Wrench Pilot is the bomb in a collaboration between Girl Skateboard’s Andy Jenkins and LA style boutique The Hundreds. Three shirts and a snapback is about all you need. It’s all good. Check it, or click here for an interview with Andy Jenkins from The Hundreds Magazine. 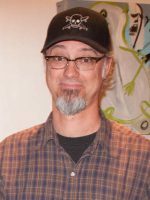 Color Magazine has followed up a print magazine feature on the Girl/ Art Dump designer and artist Andy Jenkins with some interviews with people who have worked with and for Andy over the years. 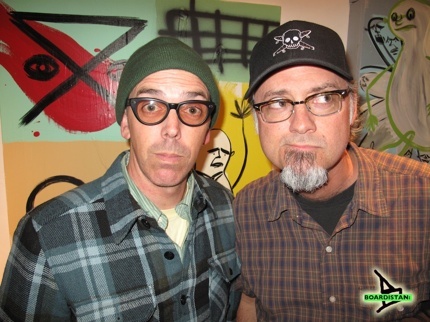 The first on the list is Girl Skateboards founder Rick Howard, who says Andy is part of the family. 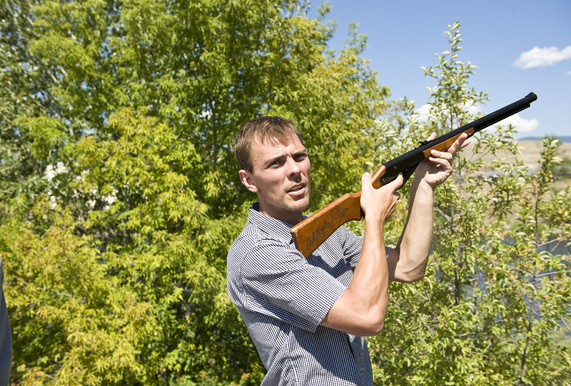 “He hired himself,” Howard said. “He did the logo and our 1st board series. The rest is history, honored that he wants to be here. Follow the link for the rest of the 10 question interview. Andy Jenkins and Girl have developed a second round of Product (Red). This time it is two limited edition Girl Mike Carroll decks. 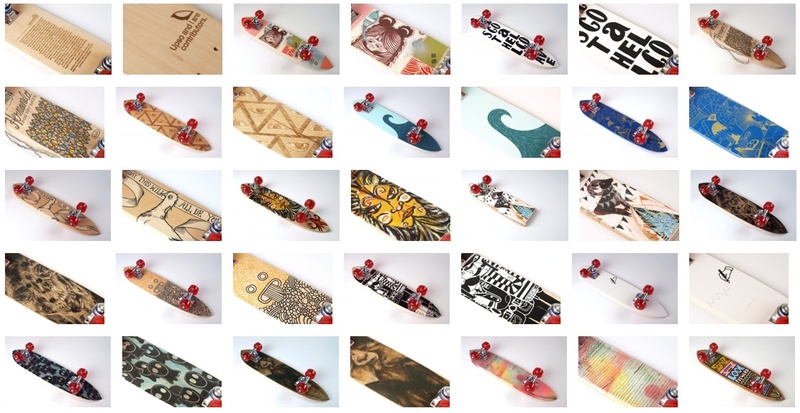 With every board sold, Girl givs a majority of its profits to the Global Fund. Join Dave B and the old school Blockhead Skateboards crew in Oceanside, California on Saturday night November 7, 2015 for their 30th Anniversary Reunion Party Art Show. The party will features classic photos by Grant Brittain, O, Spike Jonze, Michael Blanchard, Steve Sherman, Mark Waters, Tobin Yelland, Hunter Kimball, Luke Ogden, Christian Kline and more, plus the art of Ron Cameron, Dave Bergthold, Ron Lemon, Andy Jenkins, and Jeremy Wray. The party begins at 7 PM at Link Soul Gallery at 530 S. Coast Highway in Oceanside, California. For all the details, please follow the jump. On Friday evening, April 6, 2012 members of Girl Skateboards‘ The Art Dump will open a group art show at THIS Los Angeles. 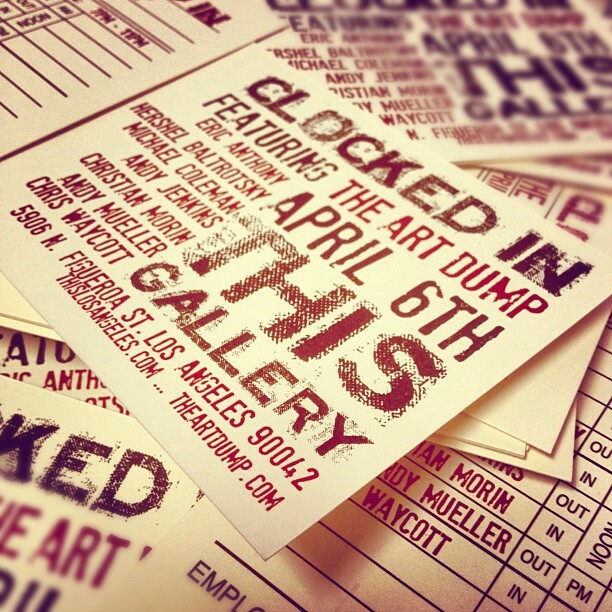 The opening begins at 7 PM. THIS Los Angeles is located at 5906 N. Figueroa St. Los Angeles. 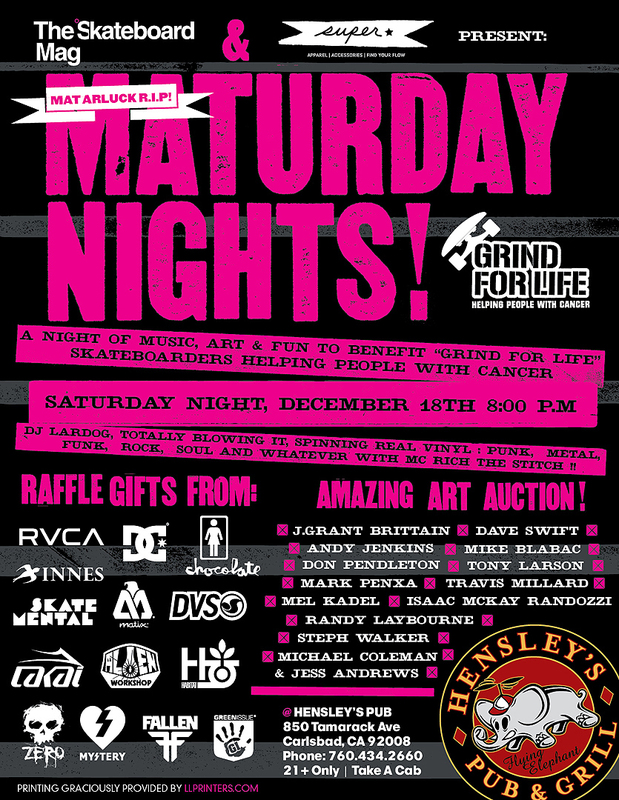 The Skateboard Mag and Super Brand are presenting Maturday Nights on December 18, 2010 to raise money for Grind For Life. The night of music, art and fun features the work of J. Grant Brittain, Dave Swift, Andy Jenkins, Mike Blabac, Don Pendleton, Tony Larson, Mark Penxa, Travis Millard, Mel Kadel, Isacc McKay Randozzi, Randy Laybourne, Steph Walker, Michael Coleman, Dan Boulton and Jess Andrews with music by DJ Lardog and MC Rich The Stich. 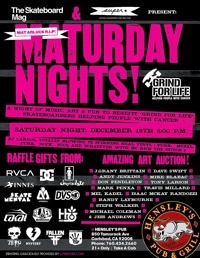 It all goes down at 8 PM Hensley’s Pub at 850 Tamarack Ave. Carlsbad, California. Follow the jump for more info. Smile On Your Brother is a traveling art show and auction (the first contributor project) “conceived by Mike Giles and Annie Lam and co-curated by Bob Kronbauer of www.clubmumble.com fame.” The show is raising money to provide 100 skateboards to disadvantaged youth across Canada. Participating artists include: Thomas Campbell, Randy Laybourne, Dave Carnie, Don Pendleton, Chris Pastras, Andy Jenkins, Andrew Pommier, Bob Kronbauer and more (click here for the full list). The art show will hit six shops in Canada (starting at Live Stock Vancouver Aug. 24-26, 2009). The Iconoclast Editions pop-up shop features work by David Ellis, Jimmy Baker, Harmony Korine, Neil Farber, Jacob Dyrenforth, Ohad Meromi, Charley Harper, Lisi Raskin, Ryan McGinness, Larry Clark, KAWS, Barry McGee, Ryan McGinley, Chris Johanson, Raymond Pettibon, Shepard Fairey, Todd Cole, Mark Gonzales, Evan Hecox, Jo Jackson, Todd James, Takashi Homma, Os Gemeos, James Jarvis, Andy Jenkins, Spike Jonze, Ari Marcopoulos, Geoff McFetridge, Steve Powers, Mike Mills, Thomas Campbell, Terry Richardson, Mark Borthwick, Craig Stecyk, Ed Templeton, Henry Chalfant, Tobin Yelland, Clare Rojas, Antonio Adams, Cynthia Connolly, PAM, Andrew Pommier, KR, Cheryl Dunn and many more. We were going to say something about Mike Mills and celebrity salad bar designers, but we’ll save that for another time..